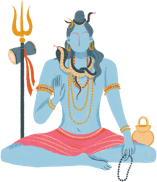 Known by many names—Mahadeva, Mahayogi, Pashupati, Nataraja, Bhairava, Vishwanath, Bhava, Bhole Nath—Lord Shiva is perhaps the most complex of Hindu deities, and one of the most powerful. Shiva is 'shakti' or power; Shiva is the destroyer—the most powerful god of the Hindu pantheon and one of the godheads in the Hindu Trinity, along with Brahma and Vishnu. As recognition of this fact, Hindus isolate his shrine separate from those of other deities in the temple. In temples, Shiva is usually is depicted as a phallic symbol, the 'linga,' which represents the energies necessary for life on both the microcosmic and the macrocosmic levels—both the world in which we live and the world which constitutes the whole of the universe. In a Shaivite temple, the 'linga' is placed in the center underneath the spire, where it symbolizes the navel of the earth. The popular belief is that the Shiva Linga or Lingam represents the phallus, the generative power in nature. But according to Swami Sivananda, this is not only a serious mistake but also a grave blunder. The actual image of Shiva is also uniquely different from other deities: his hair is piled high on the top of his head, with a crescent tucked into it and the river Ganges tumbling from his hair. Around his neck is a coiled serpent representing Kundalini, the spiritual energy within life. He holds a trident in his left hand, in which is bound the 'damroo' (small leather drum). He sits on a tiger skin and on his right is a water pot. He wears the 'Rudraksha' beads, and his whole body is smeared with ash. Shiva is also often portrayed as the supreme ascetic with a passive and composed disposition. Sometimes he is depicted riding a bull called Nandi, decked in garlands. A very complicated deity, Shiva is one of the most fascinating of Hindu gods. Shiva is believed to be at the core of the centrifugal force of the universe, due to his responsibility for death and destruction. Unlike the godhead Brahma the Creator, or Vishnu the Preserver, Shiva is the dissolving force in life. But Shiva dissolves to create since death is necessary for rebirth into a new life. So the opposites of life and death, creation and destruction, both reside in his character. 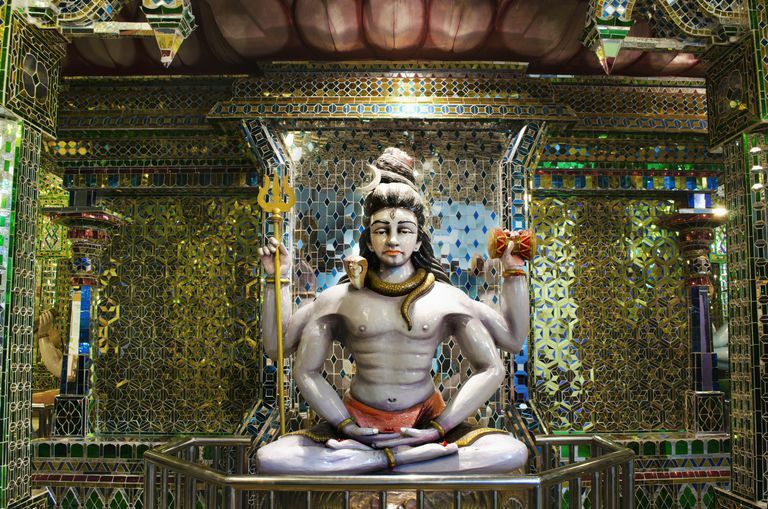 Since Shiva is regarded as a mighty destructive power, to numb his negative potentials, he is fed with opium and is also termed as 'Bhole Shankar'— one who is oblivious of the world. Therefore, on Maha Shivratri, the night of Shiva worship, devotees, especially the men, prepare an intoxicating drink called 'Thandai' (made from cannabis, almonds, and milk), sing songs in praise of the Lord and dance to the rhythm of the drums.